By developing an ion-sensitive field-effect transistor with small gate dimensions, scientists at the University of Applied Sciences Kaiserslautern in Germany were able to measure cell-substrate adhesion on the single cell scale. To survive, most mammalian cells attach to other cells and the extracellular environment in order to regulate their growth, proliferation, and migration. Electrical impedance spectroscopy is one way to quantitatively monitor cell-substrate interactions. The strength of cellular adhesion to a substrate with integrated electrodes can be measured by comparing the ratio of the readout voltage to the applied alternating current. Yet this method is limited groups of many cells as the size of the microelectrode must be larger than 100 μm in diameter. Smaller features are subject to greater interface impedance between the electrode and liquid media and this background impedance overwhelms the desired cell-substrate measurements. 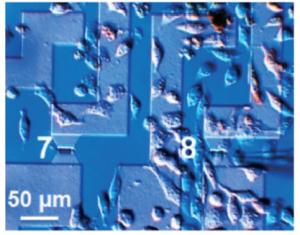 Suslorapova and colleagues thus used an ion-sensitive field-effect transistor (ISFET) with small gate dimensions to overcome this limitation. The group was able measure the effects of enzymatic digestion with trypsin and an apoptosis-inducing drug on single cell detachment using the ISFET devices with a 16 by 2 square micron gate. The authors create an equivalent circuit model to interpret recorded impedance spectra from their single cell and small cell groups grown in contact with the field-effect transistor devices. The seal resistance and membrane capacitance parameters which can be extracted from the measured transistor transfer function (TTF) provide measures of cell shape and adhesion to the substrate. 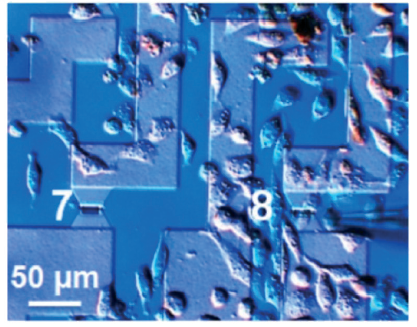 Changes in TTF correspond to adhesion of individual cells on top of the ISFET gates. This platform and the model developed to interpret TTF signal opens exciting avenues to monitoring cell adhesion in high throughput yet still at single cell resolution. Download the full research paper paper for free* for a limited time only! *Access is free until 27.03.15 through a publishing personal account. It’s quick, easy and free to register! Take a look at our Lab on a Chip 2015 HOT Articles Collection! *Access is free until 11.03.15 through a publishing personal account. It’s quick, easy and free to register! When testing the effects of drugs on cells and tissues, laboratory scientists generally use a pretty crude approach. They simply mix the desired concentration of the drug with the culture medium and then add it to separate plastic wells in which cells or tissues have been cultured. Of course, this approach has its limitations: when testing many different concentrations and mixtures of drugs, the amount of wells needed for an experiment grows very quickly to overwhelming numbers. Moreover, all of the drug is generally added at once, not taking into account the gradual pharmacokinetic profiles that you would normally find in the human body. 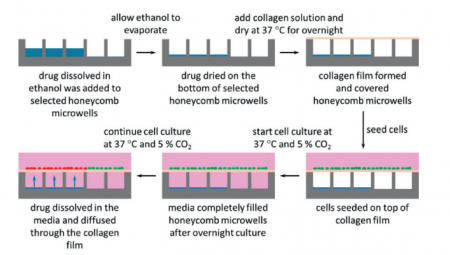 In a paper in Lab on a Chip, scientists from Corning, Inc. and Massachusetts General Hospital demonstrate a new, microengineered approach for treating cultured cells with drugs. Instead of growing the cells on flat surfaces, cells are grown on micro-modified wells plates that contain regular patterns of tiny holes. The microholes can be filled with dried-up drug and then sealed off with a semi-permeable layer of collagen. When cells are grown on the collagen, culture medium starts seeping into the air-filled microholes. 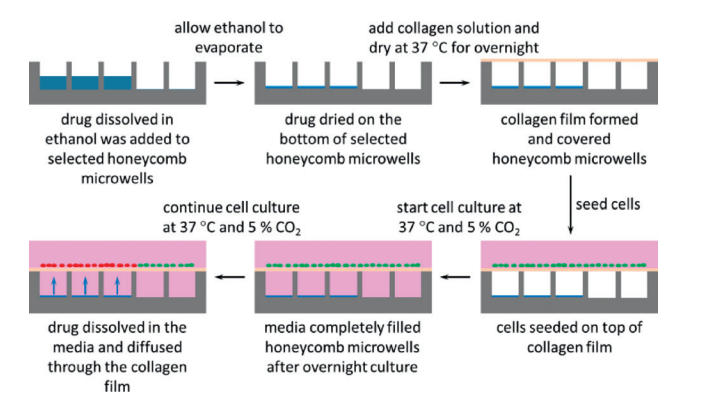 The dried-up drug then dissolves and diffuses through the collagen layer, exposing the microscopic patch of cells around the microhole to the drug (see also the figure below). The authors only show the results of a simple proof-of-principle experiment with Nefazodone-filled holes leading to local toxicity for cultured liver cells. The technique looks promising however, and it will be interesting to see further development. How easy will it be to load holes with different concentrations and mixtures of drugs? Can the process of drugs diffusing into the medium be controlled? Can we control time-release profiles by changing the shape of the holes, by changing the surface properties of the holes, or maybe by changing the gas content of the medium? It will also be interesting to see whether the technique can be combined with high-throughput imaging, like fluorescence microscopy or scanning electrochemical microscopy as was recently shown for cells in microscopic wells by Sridhar, et al. Make sure to check out the paper by Goral, et al. in which they outline their technique while it is still free* to access. *Access is free until 9.03.15 through a publishing personal account. It’s quick, easy and free to register! You are currently browsing the Lab on a Chip Blog blog archives for February, 2015.